44Mag and/or 45 Colt, Which way to go? The general idea here was to develop bullets and loads to optimize the capability of specific classes of guns and allow shooters to have a choice of power levels. The five following .45 revolver loads cover a lot of ground but all are based on the time proven “Hammerhead” bullet design as evolved by Randy Garrett and carried on to the .45 revolver by myself (Ashley Emerson). There are two new 365HH’s the first has been optimized for large frame Rugers chambered in .45Colt. This load is our new 45LFR+P load that drives a 365gr Hammerhead bullet to 1250fps from my factory 7½” Ruger Bisley, (and 1180fps from my 5 ½” Redhawk). This 365gr bullet weight came from “growing” Randy’s 330gr/44HH up to .452. Extensive testing proved to me that this bullet design and alloy, when shot thru traditional revolver twist rate barrels, gave the ultimate performance. This “LFR” bullet was specifically designed to make an overall length (O.A.L.) that would NOT fit in a S&W mod. 25, Colt S.A., or small frame Ruger revolvers. The other 365HH is for the 454. This bullet has the exact same nose profile as the other three new 45 caliber HH’s, it is, as stated before, a grown up to .452 version of Randy Garrett”;s excellent 330HH he used in the 330+P 44 MAG loads. This all important nose shape includes a .335 (sharp edged) meplat (flat nose), that transitions to a +.001 bore riding cylindrical section in approximately ½ a caliber which terminates at the first driving band. This driving band is above the crimp groove and is seen on the loaded cartridge just forward of the crimp. I have been a student of the heavy revolver for over 40 years, have killed hundreds and hundreds of various animals with them and have sent tens of thousands of handgun bullets down range. I have used virtually every bullet shape, weight and configuration available. The last 20 years has for me included an incredible amount of wild hog hunting and shown me there was no more reliable shape, weight or configuration than the heavy Garrett Hammerhead made to Randy’s specs, using Randy’s techniques and his custom alloy. If something else was a more reliable killer, I would be using it. Other design features that are included on all four new 45HH’s are gas checks on a properly long gas check shank and LBT “blue” lube. The crimp groove on the 365HH/454 bullet yields a long overall length but not so long as to keep it out of any known factory chambered 454. This 365gr/454HH bullet is available in two loads; the 454 Hammerhead, (365gr@1350fps from a 7½” Freedom Arms) and the H454 Hammerhead (365gr@1500fps from a 7 ½” Freedom Arms). During the 2014 hunting season, long-time friend, mentor, and hunting partner, John Taffin, took the first animals with the new 454 Hammerhead load, stomping both a trophy elk and a bison with this 1350fps load. “Bullet testing”, we call it. Thanks John. 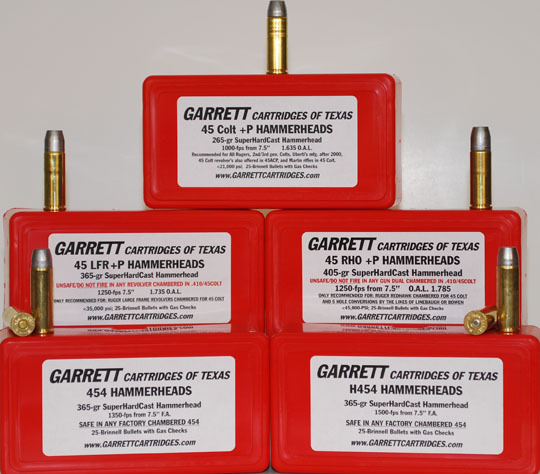 The heaviest of the new Garrett Hammerhead bullets weighs in at 405 grains for use in the 405HH/45RHO. This load was designed to take advantage of the long/heavy cylinder and 1-16 twist rate of the standard 45 Colt chambered Redhawk. This load drives the new 405 bullet to 1250fps from a 7 ½” Redhawk. From my 4” Redhawk it averages 1170fps (for perspective, the 1873 trapdoor carbine load ran a 405gr@1100fps), and from my 16”(1-20) Grizzly Custom Marlin it runs 1440fps (the 1873 trapdoor rifle ran a 405gr at around 1350fps). This 405HH in the RHO load makes the 6 shot, double action, $900 4” Redhawk quite the bargain for serious bear defense. While this load is recommended for REDHAWKS ONLY, there are custom gunsmiths out there building 5 shot custom revolvers that are more than up to the task of handling this load. The following is a list of custom builders that are friends and have given me permission to recommend their 5 shot guns for the 405HH-RHO load. There are many custom revolver builders I don”;t know so if you have a gun built by someone I don’t list then ask them for their opinion. No need to bother the following builders as they have all personally assured me that their large frame 5 shot guns are fine with the 405HH-RHO load. Hamilton Bowen, John Gallagher, John Linebaugh, Gary Reeder, David Clements and Alan Hartman. The last of the new loads is the 265gr/45Colt+P Hammerhead. Everything here is the same as the 365 and 405HH”;s except weight. Same nose and like the others it is gas checked. This is a load designed to be safe in all Ruger’s, 2nd & 3rd gen. Colts, Uberti’s manufactured after 2000, revolvers chambered in 45 Colt that are also offered in 45ACP (for example; S&W mod. 25), and Marlin rifles in 45 Colt. Many of those are “fixed sight” revolvers and I chose the 265 weight so that at a meaningful velocity the point of aim/point of impact would be useful as a hunting proposition. From my 7½” Ruger Bisley, 265gr@1000fps, from a 4” S&W @ 930fps, and from my 4.75 USFA @ 940fps. In the past “Garrett” has heard many complaints that the heavy 44HH’s were not compatible with the twist rates, (because of long bullets), or feed mechanisms (because of long o.a.l.) of the popular Marlin 1894. The 265HH in the 45 Colt+P load just happens to work wonderfully in the Marlin. This is by accident, not by design. This load, (like other Garrett loads), was designed to give optimum performance in a revolver with no compromise to O.A.L. or bullet shape to make it work in the Marlin. It does however work in the Marlins tested so far and in some other lever actions but by no means all 45Colt rifles. When chronographed from both 18” and 24” Marlins, the velocity averaged about 1200fps from either gun. Considering the minimal recoil, this properly designed bullet (265HH@1200fps), offers incredible killing potential in the Marlin. In fact, when shot from my 24” octagon 1894 Cowboy in 45 Colt (w/soft recoil pad), the report and recoil are deceptively mild. Bringing these 45 caliber revolver loads to the market has been the plan since I bought the company. They are as perfect as I know how to make them, and I have not settled for less. I hand-cast each bullet myself and handload each round myself.